I really didn't believe this poached salmon method would work for any weight, but it does, I've tested it and I'll tell you why it works after I've told you what to do and the story behind it. Now in 1987 or thereabouts, my family owned a wet fish business and one day I was serving in the shop when a customer asked me how to poach a whole salmon. I was going to reach for the cookery book, but there was another customer in at the time – her name was Miss Salmon, funnily enough – and she came up with this simple method that worked every time, no matter how big or small the piece of fish. 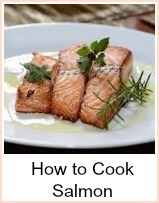 Take a piece of tinfoil large enough to make a parcel round the salmon. Brush the tinfoil with oil and lay the salmon in the middle. Season with lemon juice and black pepper – you can add some dill or other herb if you like at this point – this is just the basic method. 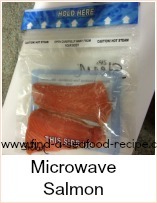 Fold the tinfoil over the salmon making a completely waterproof parcel by folding the ends together. Place in a pan large enough to hold the parcel, cover with water and then bring up to boiling point. Turn off the heat and leave the salmon in the water until it’s cold. You will have perfectly cooked salmon every time, no matter how small or large the piece. When the water reaches boiling point in the pan, that means that it has heated everything in that pan to the same temperature – ie, it’s all at boiling point including that piece of fish right through to the center – so that also takes longer the larger the piece of fish – so once again, longer in the cooking water. And thirdly, the larger the piece of fish, the more water the longer it takes to cool down as well – so once again, the larger piece of fish is longer in the cooking water. That’s why it works every time, no matter how big the poached salmon piece because it’s proportional – like any other cooking method. Enjoy this poached salmon with new potatoes and salad – or use it in sandwiches with mayonnaise – delicious. You could use it to cook a whole salmon as the center of your party or celebration – how about a whole salmon for an easter meal instead of a turkey? 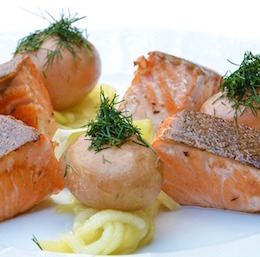 A foolproof method of poaching salmon that works every time. 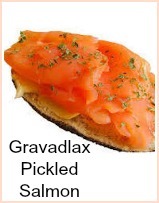 How long it takes will depend on the size of your salmon.